I know that we are in the height of the holiday season, but for our house Fall is mostly about game-day eats. I married the ultimate armchair quarterback. BL grew up in northern Wisconsin and if you’ve ever met anyone who’s from that area of the country, then you know how #sportsobsessed they are. While things have settled down quite a bit since we become parents, BL still usually requests a few hours on Sunday to relax, watch the game(s) and enjoy some football eats. That means I start getting texts on Friday afternoon with his brainstorms on what he wants to snack on. It’s usually a spread of some kind: nachos, tacos, potato nachos, and chili usually top the list. Can you sense a theme here? Spicy, loaded and topped are all things that he craves when on the couch, and for good reason. Football fare isn’t about salads. It’s about delicious, shareable appetizers that you can put out in advance and are still delicious at half-time. These potatoes are a mix of all of our favorites. Crispy smashed potatoes, guacamole, black bean salsa and fresh herbs. 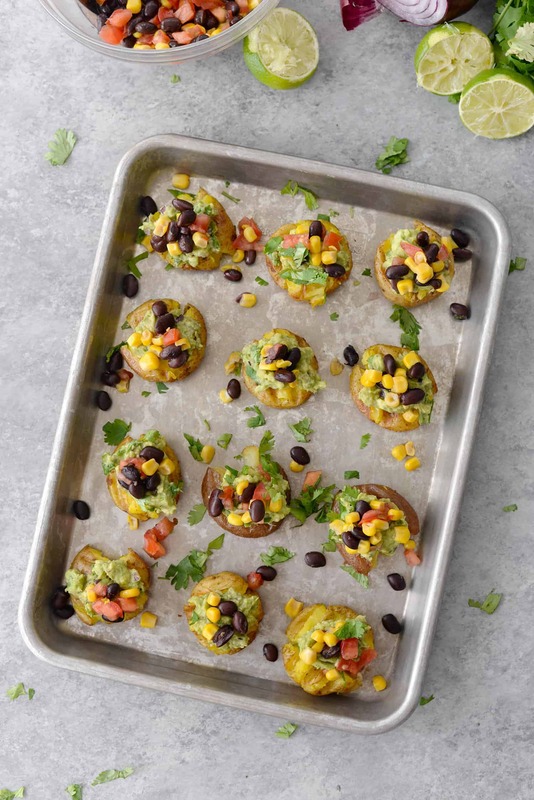 If you love chips and salsa or guacamole, then you will love these vegan smashed potatoes. They hit all of the flavor and texture notes, so, so good! 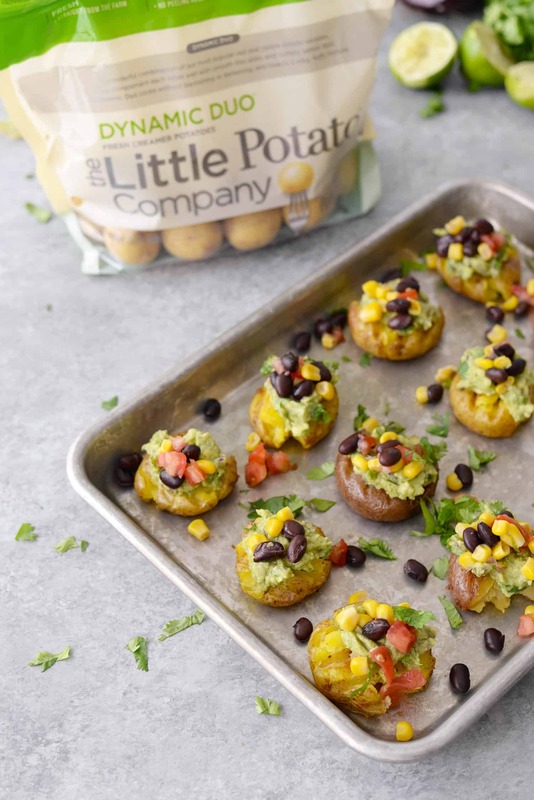 The star of this recipe is The Little Potato Company‘s Dynamic Duo potatoes! If you’ve followed me for the last few year, then you know what a fan we are of The Little Potato Company‘s offerings. They really are the BEST potatoes, the texture and flavor doesn’t compare. 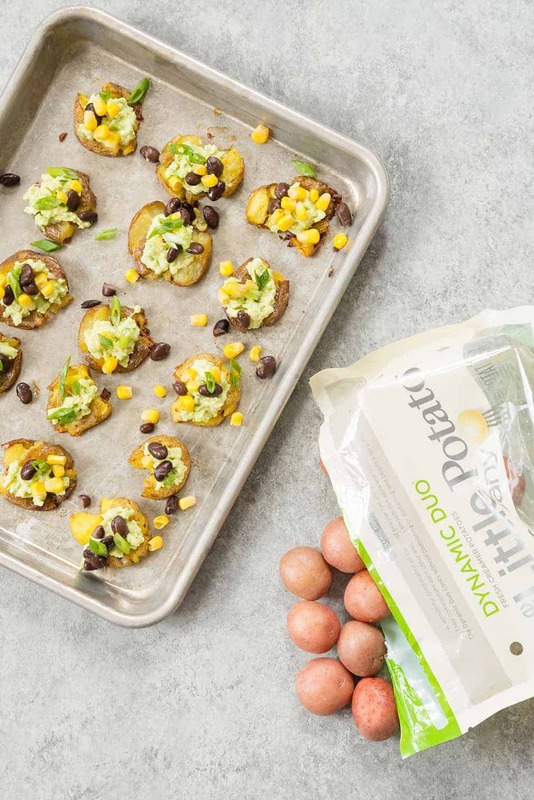 The Dynamic Duo potatoes combine their red and yellow Creamer potatoes that play beautifully together, delivering silky smooth textures and delicious flavor. Cook them until soft, then gently smash (tip: use a large glass or the bottom of a wine bottle) and roast in the oven until crispy and golden. While the potatoes are cooking, make the quick guacamole and fresh bean salsa, then top on the warm Little potatoes. YUM. The contrast of warm, crispy potatoes and cool salsa is just incredible. 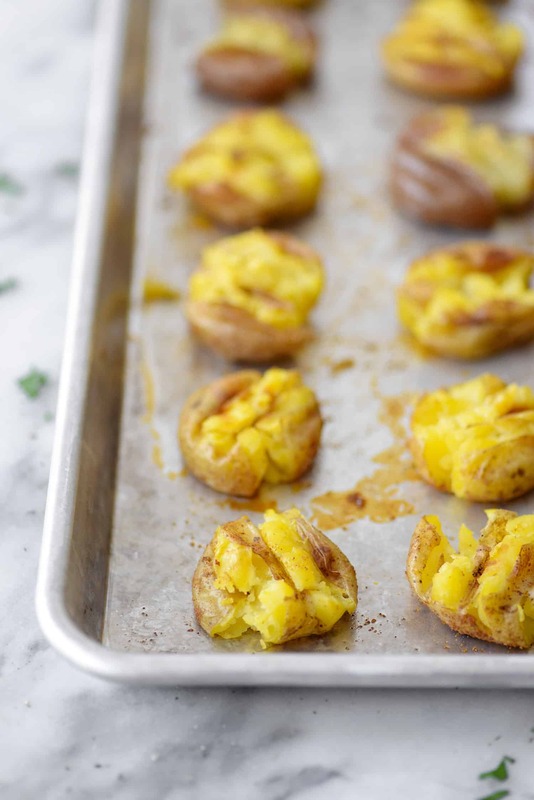 I kept these vegan and gluten-free for everyone to enjoy, but you can also add a little shredded cheddar cheese while the potatoes are baking for a vegetarian version. We’re big fans of potatoes. Creamer potatoes are gluten-free, a good source of potassium, vitamin C, fiber and only 100 calories per serving. I say this often, but it’s crazy that some people think potatoes aren’t a healthy option in the diet. 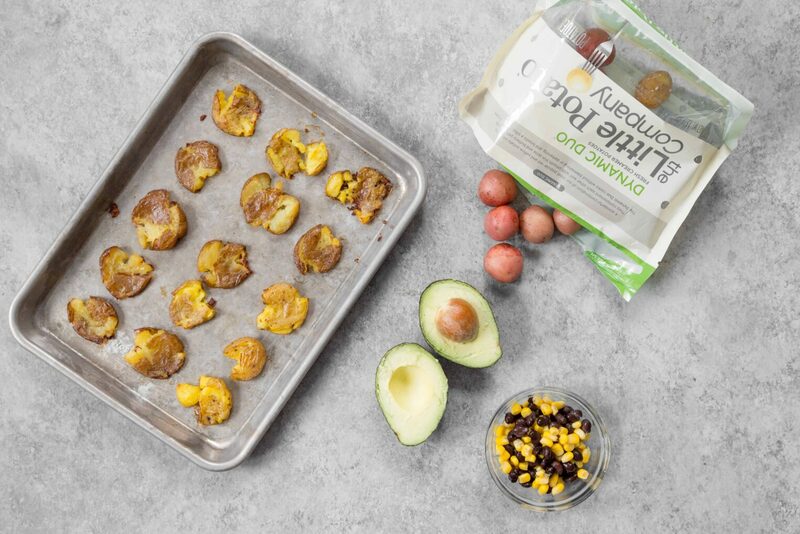 It’s one of the reasons I’ve teamed up with The Little Potato Company over the past few years, to dispel myths around potatoes and to encourage all of us to shift our plate: less meat, more fruits/vegetables and healthy grains. Those diet shifts are the most powerful when it comes to reducing chronic disease and promoting longevity. No matter what’s on the rest of your plate, all of us can benefit from adding in more of these nutritious foods. Hope you enjoy these Little potatoes as much as we do! And, if you’re still searching for healthy vegan side-dishes for the holidays this year, check out my round-up of over 60 different recipes here. Vegan Loaded Smashed Potatoes! 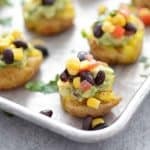 If you are looking for a vegan and gluten-free appetizer, this is it! 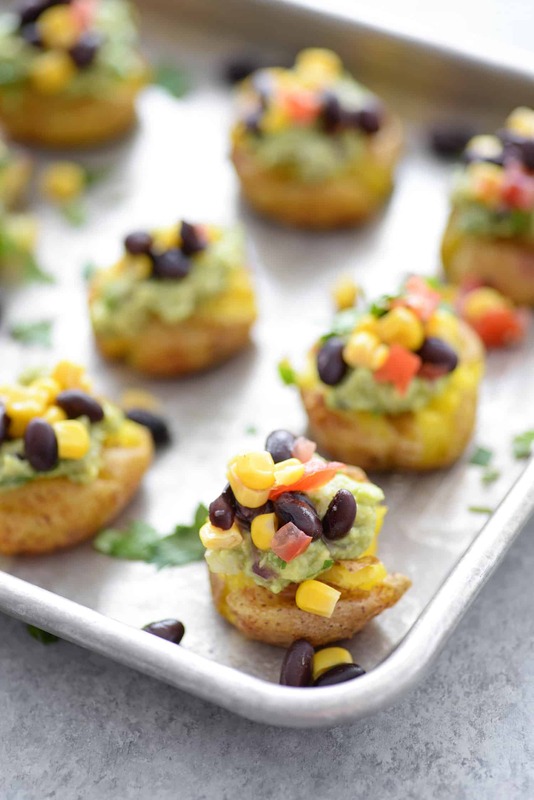 Smashed potatoes topped with guacamole and corn and bean salsa. A healthy option for football snacks, superbowl and parties. Preheat oven to 400 degrees F. Toss the potatoes with salt, 1/2 teaspoon cumin, 1/4 teaspoon smoked paprika, 1/2 teaspoon salt, 1/2 teaspoon freshly ground pepper until well combined. Place on a baking sheet and roast for 25-30 minutes until fork tender. Remove the potatoes, then gently smash using a potato smasher or back of a wooden spoon. Return back to the oven and cook another 5 minutes until crispy. Remove and let cool. In a separate bowl, stir together the corn, black beans and tomatoes with the remaining lime zest and juice. 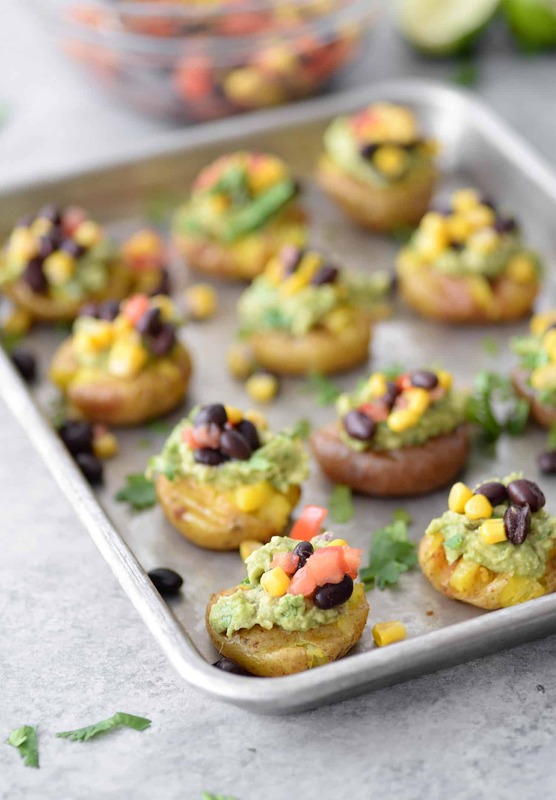 To assemble, place the potatoes on a platter, top with guacamole and corn salsa. Garnish with cilantro and serve!